There’s a period of time from around the week before Thanksgiving until the new year begins when I basically fall off the grid. It is not intentional. Between travel and family obligations and work and the cold weather and the early sunsets and prepping for Christmas and a dozen other things I could rattle off, I tend to turn my attention solely toward our little family and finishing out the year in a way that feels tidy and…well, finished. I like feeling as if the next year is beginning with a clean slate. So, here are a few highlights to show what we have been up to for the past few months. Thank you for everyone who has been checking in here on the blog, on our new Facebook page, and of course in person everyday. 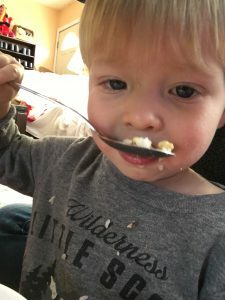 We are so appreciative for everyone’s love and support throughout Oliver’s galactosemia journey. We traveled to Richmond to visit our families over Thanksgiving and Oliver got to partake in some of my mom’s homemade Korean food. Fermented soy being moved to the occasional food list has been a really nice surprise this year. 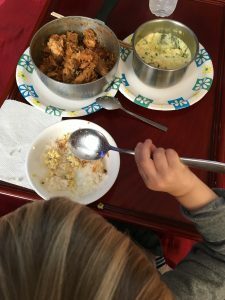 Sharing cultural memories through food with my mom and my son is an incredibly special thing! My family as a whole has been really supportive and accommodating when it comes to meals with Oliver. With only a few modifications, we were able to make our entire Thanksgiving dinner dairy-free (for the second year in a row)! The only item that we made special for John, Oliver, and myself was the gravy. (I have not perfected this recipe enough for others to find it to be an acceptable substitute for the real deal.) My sister, Tammy, who has always baked all of the holiday pies for the family, goes out of her way each year to make multiple pies that are dairy-free (apple, cherry, pumpkin), as well as dairy-free oreo balls which are a Lucy family favorite! She even makes sure to pick up dairy-free whipped topping so we do not miss out on any of the experience! Oliver loved every sticky-fingered second of it! Speaking of sweets! 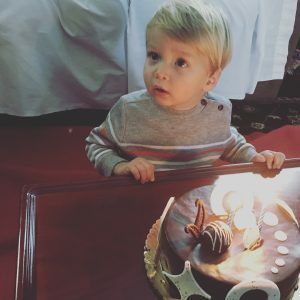 While we were with family, we celebrated Oliver’s birthday a little early. My other sister, Maria, was able to make the trek from New York and brought a special birthday cake for Ollie! A beautiful and absolutely delicious pareve cake from a kosher bakery in Queens. “Pareve” food items are prepared in accordance with Jewish law and mean that they contain no meat or dairy. You can also find lots of products in the grocery store labeled as “pareve” or “parve” and are marked with a “U” which generally means they are safe for a galactosemia diet. However, I always (always!) check the ingredient labels to be absolutely certain. 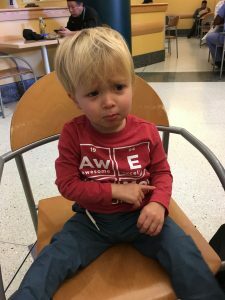 Oliver had his last check-up with his doctors in Philadelphia on Halloween day. Hospital days are always a little stressful, although we’ve learned to manage the anxiety a lot better as time has gone on. We received his latest numbers while we were in the car driving down to Virginia. Ollie’s blood tests are not your run-of-the-mill tests, so it always takes a while to get the results. Our team has been really great about contacting us with the preliminary results as soon as they can so we do not have to wait for the formal results to be certified before we find out where we stand. We were very happy to find Ollie’s downward trend for his Gal-1-P continues. He is down just slightly to 7.55 which is always what we are hoping for. We continue to want to get him down below 5 but everyone, including us, are happy he continues to make progress. The blood draw at his last appointment was especially difficult. Oliver is now very aware of what is going on and does not bounce back as quickly after the poke. When he was younger, he seemed to forget about the needle almost as soon as it was over, but this time around Ollie would point to his arm and start crying a few times over the next few hours. “Ouchy.” It is gut-wrenching. I know he will eventually understand why these tests are so important and hospital days will continue to be days we ply him with treats and fun activities well into the future. Whatever it takes to make these days go a little easier for him and to ease whatever discomfort he is feeling. 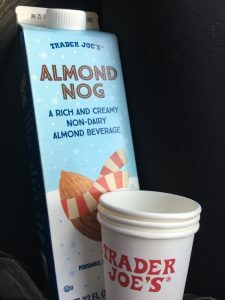 On the ride back, we stopped at Trader Joe’s and started off the holiday festivities right with some of their Almond Nog. We drank it out of paper cups in the car. Definitely was a tasty little treat. 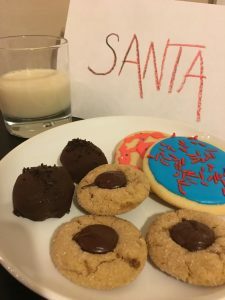 Christmas is tough because, like many holidays, it revolves around food, and sweets, and traditions, and American delicacies seem to heavily include dairy products. 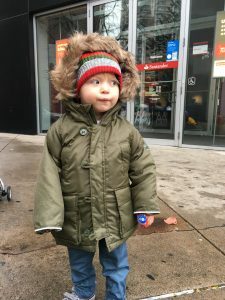 We never want Oliver to miss out on any experiences if we can help it, so we continue to find ways to adapt, alter, modify, or out-and-out change whatever we need to so we can be sure we can create happy holiday memories and traditions and never feel left out. 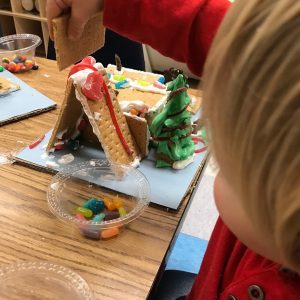 Whether it be holiday parades where candy is being chucked at us from every direction, building gingerbread houses at school, or baking Christmas cookies for Santa, Oliver did it all this year! We are starting to explain certain things to him, even if he can’t quite grasp it all fully yet. “This candy has milk in it, so let’s have this other piece instead.” It helps us get in the habit of trying to educate him instead of just making choices for him. It is important for us that he understands the why as much as is age appropriate. Some times are harder than others. Have you ever tried to explain to a two-year-old why he can’t have a beautifully frosted snowman sugar cookie? And it keeps us on our A-game to always make sure we have an alternative available for him, whether it be at school or with friends. Which reminds me…our Ollie has the absolute BEST teachers around! 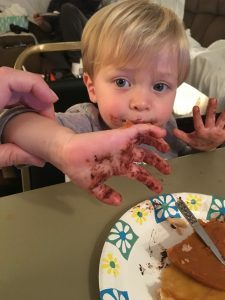 They go out of their way to make sure that he is always safe when it comes to what he’s eating at school and are constantly keeping me up-to-date on current goings on so I know when another child’s parents are planning birthday treats and whether Oliver will be able to participate. It makes a big difference knowing we are not in this alone and they are helping make Oliver’s experiences the best possible! We are ringing in the New Year at home, in our PJs, and O has been in bed since 8pm. Not the most exciting celebration night I’ve ever rung in, but we are so unbelievably happy to have another year of a healthy little boy under our belts. This time two years ago we were exhausted new parents who were running largely off of caffeine and anxiety and could not look confidently into the future to know better times were ahead. Fast forward to today and we are starting to feel a little more secure and a lot more confident…but still heavily caffeinated. So from our family to yours, we are wishing you a very prosperous, joyous 2018! May it be filled with love and laughter!